Disney's The Lone Ranger Rides Into Town July 3, 2013! 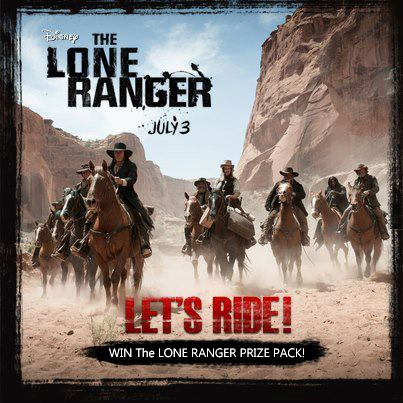 The Lone Ranger is Disney's highly anticipated western that rides into theatres everywhere on July 3rd, 2013! The movie stars the talent of Johnny Depp, Armie Hammer, Tom Wilkinson, William Fichtner, Barry Pepper, James Badge Dale, Ruth Wilson, and Helena Bonham Carter. It is produced by Jerry Bruckheimer and directed by Gore Verbinski (both of Pirates of the Caribbean franchise). Disney describes The Lone Ranger as "a thrilling adventure infused with action and humour, in which the famed masked hero hero is brought to life through new eyes." 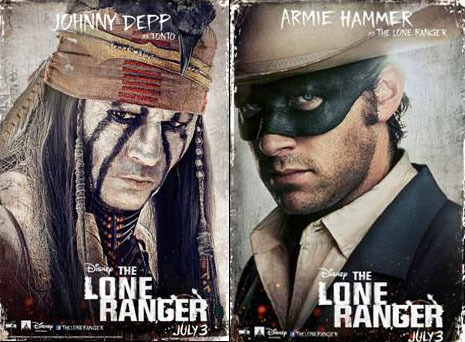 Johnny Depp & Armie Hammer Star in The Lone Ranger! Brought together by fate, Native American spirit warrior Tonto (Johnny Depp) and sheriff Jon Reid (Armie Hammer) must unite to combat corruption and greed. Tonto narrates the story of how John Reid is transformed from a sheriff, into The Lone Ranger--a legend of justice. Expect humour, action, surprises, and the forces of good to prevail over evil. The Lone Ranger was also a beloved television series, which ran from 1949 until 1957. It starred Clayton Moore as The Lone Ranger (John Hart from 1952 to 1954) and Jay Silverheels as Tonto. The exclamation "Heigh-Ho Silver" and the question "Who was that masked man?" both originated from the popular tv series. WIN a The Lone Ranger prize pack from the SnyMed blog! Prize pack consists of: $25 gift card for EB Games, The Lone Ranger t-shirt, The Lone Ranger baseball cap, The Lone Ranger USB key, The Lone Ranger mask, and The Lone Ranger movie poster! 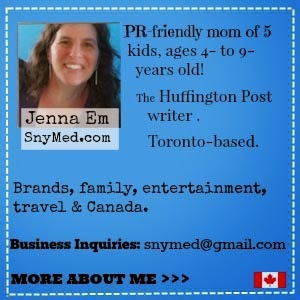 Open to Canada (sorry Quebec), ends Friday July 12th, 2013 at 11:00am EST. Please check your e-mails at that time! Leave a COMMENT below stating if you ever saw the original The Lone Ranger series, OR if you are excited to see The Lone Ranger 2013 film, OR if you have ever seen any Johnny Depp movies. Then use the entry form below to enter the contest. GOOD LUCK! Yes - had a chance to see the original film years back. Thanks so much. I haven't seen the original lone ranger movie, but excited to check this one out though. The original Lone Ranger TV show was one of my faves as a kid (in black & white)! I'm excited to see the 2013 version! I can't wait to see the new movie just love Johnny Depp. Saw episodes of the original series, looking forward to the movie and have seen several Johnny Depp movies. I never saw the original Lone Ranger. I've seen some Johnny Depp flicks, for sure. I'm sure I've seen in the past but can't remember it! I remember watching the original tv series when I was little but it must have been the reruns. I would love to see this movie, the trailer was excellent. I'm very excited to see the new movie.I didn't see the original series. I watched the original series as a kid and I'm looking forward to seeing the new movie version.I've seen all of Johnny Depp's movies. I watched the series when I was a kid and dearly loved it then. It will be great to see this remake. I have seen the original and would love to watch the remake! Watched the original so it'll be nice to see Johnny Depp's style, looks great. I used to watch the original Lone Ranger with my dad. I've seen probably all of johnny Depp's movies. my whole family grew up being big Lone Ranger fans all during our younger years! Can't wait to see the new flick! Have seen the serial and a few TV episodes. AS for Depp, I think I've seen most of his movies. I guess I must be a fan. I was just talking with my boyfriend about how Johnny Depp has such an amazing portfolio of work. Can't wait to see this movie! I have see some of the original shows and am looking forward to the new movie. I never saw the original series, but I am looking forward to seeing the movie -- I love Johnny Depp and Disney. I saw the new The lone ranger at a preview on Monday night. It was great. My hubby is a Lone Ranger fan & has seen most of the original series - he'll be going to see the new movie. Looking forward to the movie and have seen several Johnny Depp movies. I have seen Pirates of the Caribean, with Johnny Depp. I would love to see this version of the Lone Ranger movie. I think he would be great with the action in the Lone Ranger movie! No, I've never seen any of the original episodes but am really looking forward to this. I've seen the old one. Can't wait to see the new one! I am excited to see this movie, looks so cool and funny too!!! I love Johnny Depp and am interested to see how he portrays Tonto. I saw the original series a long time ago when they were in reruns and I was a little kid. Looking forward to seeing it. I haven't seen the original movie. I didn't see the original movie but I'm looking forward to seeing this one. I havn't seen the original but I would like to see it some time and am very much wanting to watch the new one as well. I HAVE SEEN THE ORIGINAL AND AM LOOKING FORWARD TO THE 2013 VERSION! I have not seen the original, but I am excited to see "The Lone Ranger 2013 film!" I would like to see The Lone Ranger 2013 film. Absolutely loved the original TV series - I know I'm giving away my age LOL! I haven't seen the original. Haven't seen the original can't wait to see the new onw. Can't wait to see the new movie, and I have seen almost all Johnny Depp movies! I have seen the original and am dying to see this new one. Anything with Johnny Depp is going to be good. we used to watch the TV Lone Ranger as kids....loved it. Haven't seen the original but I can't wait to see this remake! Huge Johnny Depp fan! I have seen the original. I would love to see the new movie and I love Depp! I am excited to watch this with my daughter. It will be cool to see what todays generation thinks of the story. Cautiously optimistic is what I'd say I am about the new Lone Ranger film. I remember watching the original Lone Ranger series on TV. I loved Silver, the Lone Ranger's horse. I have not seen the original series but plan to see the movie next week. Besides, it has Johny Depp, how can it not be good!